As a parent, the decision of where to send your child to school is one of the most important decisions you’ll ever make. It’s especially vital to consider school options when your child is at a young age, when it is often easiest to accustom them to a positive, encouraging environment and get them started in their studies on the right footing. A traditional public school may be the selection for many parents, but a Montessori school has many advantages that public schools don’t provide. Consider these common differences between a Montessori school and traditional public schools before settling on where you send your child. In a traditional public school, the number of children in each class is typically at least 25 to 30 students, sometimes higher. Normally, public schools have one teacher per classroom, with possibly an assistant or student teacher in special cases. At a Montessori school, however, the ratio of children to teachers is much smaller, and there are usually older children present to help guide younger children, which encourages more peer learning and coaching opportunities. A typical public school classroom is driven by the teacher’s lesson plans. The entire class is expected to keep pace with what the teacher is covering. That can be a challenge for children who learn at a faster or slower speed than most of the other students in the class. It can also mean that children who learn better through less conventional means do not get the time they need to study. In Montessori classes, teachers do not spend as much time instructing the whole class. Instead, they present brief lessons to small groups at a time, fostering the child’s own individual learning style and pace. Traditional public schools spend much time concentrating on a child’s social development, from group activities in class to team sports and school assemblies. While that’s a plus for many children, it can be a challenge too. Students can end up focusing on socializing rather than learning. Montessori schools offer a wide variety of multi-sensory materials for children to work with and children have more freedom to move about the classroom in exploration, which promotes cognitive development. Unlike traditional classrooms, where it is necessary for the teacher to act as the outside enforcer of disciple, Montessori students are encouraged to develop and exhibit self-discipline. The youngest students are given clear-cut ground rules and limited external structure as they learn how to approach their studies. By age five or six, children adhere to individualized study plans that they can follow in the order they wish throughout the week. They can decide how much time each project needs, as well as enjoy time for pursuing topics that capture their imaginations. As a result, they learn to spot their own errors and successes, rather than having errors pointed out by the teacher, as is common in public school classrooms. For the public school teacher, the classroom is an arena, and the teacher sits at its center. Most of the action revolves around the teacher’s time table and agenda because of the nature of how public schools are set up. At a Montessori school, that structure is different, and it allows the teacher to be less of a ringmaster and more of a guide and support as the children explore for themselves what they are currently studying. Another element of public school structure is the need to adhere to a strict time schedule. Students must be in science class at a certain time, in art class at a certain time, and so on. In addition, each subject is assigned a specific time frame in which learning must occur. Montessori schools allow for a different approach, in which students can choose what they work on, when they want to work on it, and for how long. This enables the child to work on a project when he or she is ready, and learning is uninterrupted by a forced switch to a different class or topic. One way to gain more information in order to choose the best school for your child is by touring the options you are considering. 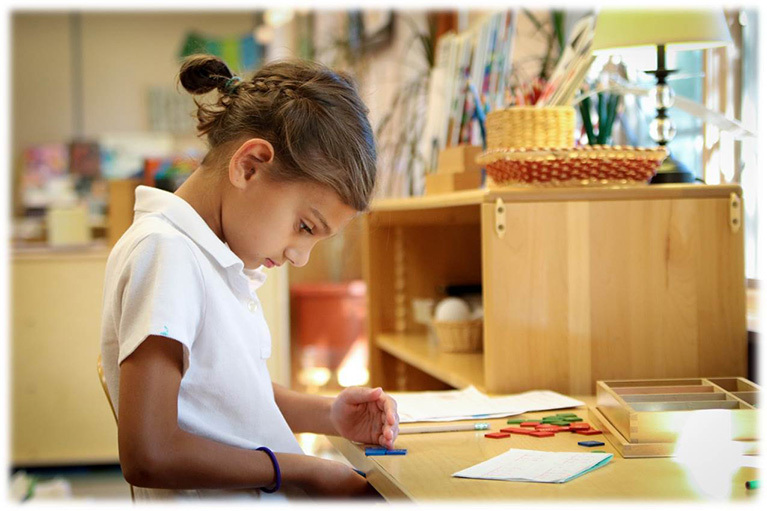 At Primary Montessori, we’re ready to help you discover all we have to offer your child. Schedule a tour today by calling our office at 301-309-9532 or using our online scheduling tool. We look forward to hearing from you!